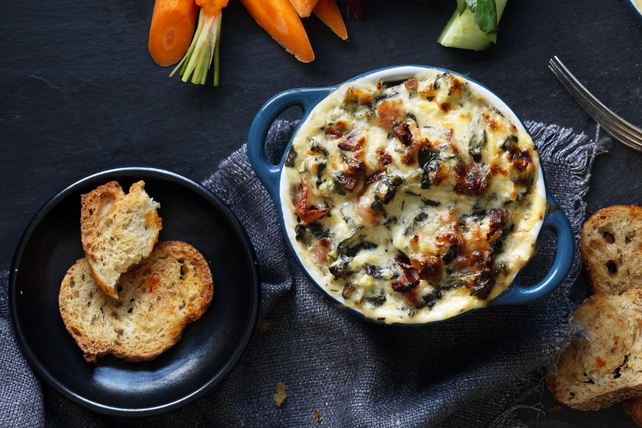 Our Three-Cheese Bacon and Kale Dip is warm, creamy and irresistible! It's a great recipe for easy entertaining. Bonus – it can be prepped ahead of time. Cook and stir kale in nonstick skillet on medium-high 3 min. or just until wilted. Combine remaining ingredients in medium bowl; stir in kale. Spoon into baking dish sprayed with cooking spray. Bake 20 min. or until dip is heated through and top is lightly browned. Serve with crostini and cut-up fresh vegetables. To make the crostini, cut a 350-g baguette into 1-inch-thick slices. Brush both sides of bread slices evenly with 1/4 cup Kraft Zesty Italian Dressing. Place in single layer on baking sheet. Bake in 400°F oven 10 to 12 min. or until edges of toast slices are golden brown, turning after 4 min. Cool. Rub edges of toast slices with 2 peeled garlic cloves. Garnish with sliced green onions before serving.